This 0.40 ct. tw. Natural Fancy Deep Brownish Greenish Yellow SI1/SI2 round pair is a rich yellow with brown and rare green overtones that at first glance appears olive. The color is very sophisticated and versatile. They have a Deep intensity that results in the terrific color saturation. These diamonds have plenty of brilliance and fabulous luster, shining and glimmering every which way in a stunning rare round cut. 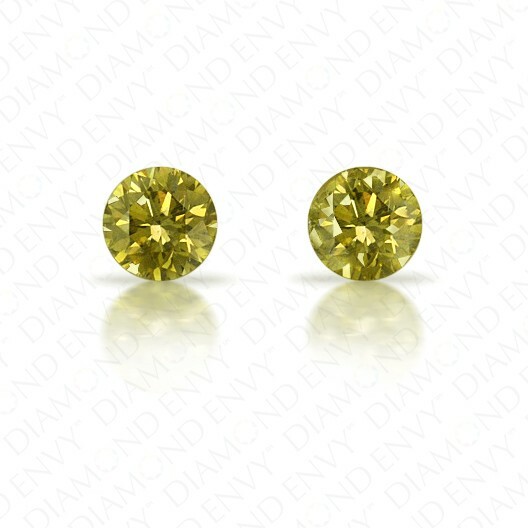 This pair of vibrant brownish greenish yellow diamonds would make a great looking pair of studs or in a three-stone ring or pendant. House-graded.